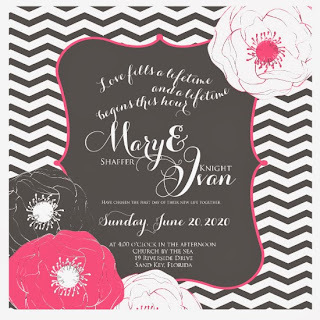 When you order wedding invitations from a professional printer or wedding invitation company, you will be presented with a large array of extras. Many of these options add to the beauty and elegance of the invitation, but they also can add significantly to the cost. Certain parts of the wedding invitation are an absolute must, but most available add-ons are simply "nice to have". If you are trying to cut costs (and who isn't), use this definitive guide to help determine which items are a must have and which ones are optional. Design & Preview Your Invites Online! time, location and hosts of the wedding, they set the tone for your entire celebration. Your wedding invitation may also include the time and location of the reception. This is nothing more than a return address on the back flap of the envelope. Having the return address is important because it will ensure that undeliverable invitations are returned to you. It will also ensure that those guests who want to send cards and gifts directly to your home will have the correct address. If your budget allows, you can have the printer print your return address on every envelope. If you want to save money, rather than having the printer do it you can write the return address yourself. You can choose a lined inner envelope to enhance the beauty of your invitation. A variety of colors are available to choose from for the perfect look for a slight additional charge. If you're looking for a place to save money, you can definitely do it here. Sure it looks nice, but would anyone really notice if you didn't have that extra layer of envelope? I doubt it. If you are having a reception, it's probably a good idea to order the reception cards. Reception cards are used to inform guests of the location of the wedding reception and or dance. 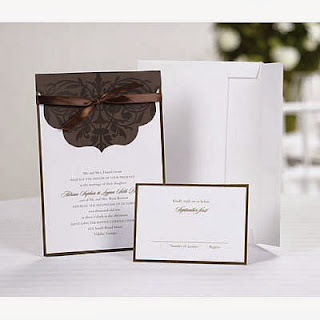 Since reception cards are enclosed in with your invitation, mailing envelopes are not necessary. Respond cards are used to help determine how many guests plan to attend your wedding. An accurate count is vital for preparing enough food, seating and other accommodations so ordering respond cards can actually save you money. When you are assembling your invitations, the response cards are included and returned by guests by the date indicated on the card (usually two weeks before the wedding.) Today, many cards are printed to allow guests to select an entree as well as indicate if they will be attending your celebration. Tip: Respond envelopes are typically included free with your respond cards. They should be printed (or written) with the address of whoever will be tallying the guest count. As a convenience for your guests, be sure to include a stamp on each envelope. D.I.Y. Wedding Invitation Kits Help Save Money! notes may be personalized with your names and used as thank you notes, gift enclosures, or for other correspondence long after the wedding. These are items you probably need, but they don't necessarily need to be ordered with your invitations. You can get generic note cards anywhere. If you do order your notes from your invitation printer, they should single mailing envelopes at no extra charge. This is the same as the invitation envelope flap, only for your note cards instead. You can save time by having your note envelope flaps printed with a return address for a slight additional charge. You can also save money in this area by doing it yourself. Many printers offer the blank notes we talked about above, plus they offer actual thank-you notes. What's the difference? Well, the price for one. Plus the thank-you notes typically say "Thank-You" on them, where are the plain notes are ... plain. Again, ordering these from your invitation printer is entirely up to you. Some brides want their thank-you notes to match the invitation. Others prefer to save money in this area, or design their own for a more personal touch. This is one of those things that you definitely don't need if you are looking to save money. The tissue paper lining came from the old days when the ink in the invitation would bleed over to the other side of the invitation. The tissue lining would prevent it from bleeding over to the other side. Of course, modern day printing does not have that problem, making the tissue paper liner completely unnecessary. Here's the bottom line ... you need the invitation card itself and possibly the reception card. But for the budget minded bride, don't be led to believe you need all the extras. Take 15% off your entire order at WhereBridesGo.com with coupon code LOVEMYBRIDESMAIDS, plus get FREE SHIPPING on orders over $100.